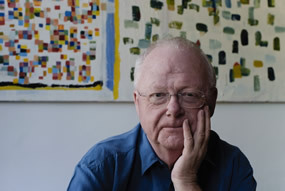 Make Music New York: Louis Andriessen’s “Hoketus” :: performed by Yarn/Wire :: June 21, 2011 from 1:00 p.m. – 2:00 p.m. :: at the New York Stock Exchange Building, 11 Wall Street, New York, NY :: Free. In partnership with Make Music New York and the Lower Manhattan Cultural Council, Darmstadt presents a performance of Louis Andreissen’s “Hoketus,” performed on the facade of the New York Stock Exchange by the extraordinary young ensemble Yarn/Wire. “Hoketus is performed with amplification set at a high volume, the two groups of instruments situating themselves as far apart as possible from one another on stage, in this case across the street from each other. Melodies are only be built through the interlocking of single notes or chords, played in alternation between the groups using the Medieval technique of hocket. The work is “heavy, loud, dissonant, and brutal, showing influence from both hard rock and the works of Igor Stravinsky (one of Andriessen’s favorite composers)”. Yarn/Wire is a chamber quartet specializing in the performance of 21st century music. A unique instrumental combination of two percussionists and two pianists allows Yarn/Wire to interface with both traditional performance practice and emergent stylistic trends with ease. Founded in 2005 at Stony Brook University, the members of Yarn/Wire have extensive performance and pedagogic experience encompassing international and domestic music festivals, college and university residences, and substantive work in the avant-garde theater and DIY/punk worlds. Frequent collaborations with composers on new work form a significant portion of the ensemble’s activities. In addition to presenting multiple US premieres, Yarn/Wire has given the world premieres of over a dozen new works written specifically for the ensemble.